This article provides you with step-by-step instructions to create a simplified environment that includes Office 365 E5, Enterprise Mobility + Security (EMS) E5, and a computer running Windows 10 Enterprise. Use the resulting environment to test the features and functionality of Microsoft 365 Enterprise. Click here for a visual map to all the articles in the Microsoft 365 Enterprise Test Lab Guide stack. Follow the steps in Phase 2 and Phase 3 of the Office 365 dev/test environment to create a lightweight Office 365 dev/test environment, as shown in Figure 1. The Office 365 E5 trial subscription is 30 days, which can be easily extended to 60 days. For a permanent test environment, create a new paid subscription with a small number of licenses. In this phase, you sign up for the EMS E5 trial subscription and add it to the same organization as your Office 365 E5 trial subscription. First, add the EMS E5 trial subscription and assign an EMS license to your global administrator account. With a private instance of an Internet browser, sign in to the Office portal with your global administrator account credentials. For help, see Where to sign in to Office 365. On the Microsoft 365 admin center tab in your browser, in the left navigation, click Billing > Purchase services. On the Purchase services page, find the Enterprise Mobility + Security E5 item. Hover your mouse pointer over it and click Start free trial. On the Confirm your order page, click Try now. On the Order receipt page, click Continue. On the Office 365 Admin center tab in your browser, in the left navigation, click Users > Active users. Click your global administrator account, and then click Edit for Product licenses. On the Product licenses pane, turn the product license for Enterprise Mobility + Security E5 to On, click Save, and then click Close twice. The Enterprise Mobility + Security E5 trial subscription is 90 days. For a permanent test environment, create a new paid subscription with a small number of licenses. If you completed Phase 3 of the Office 365 dev/test environment, repeat steps 8 and 9 of the previous procedure for all of your other accounts (User 2, User 3, User 4, and User 5). 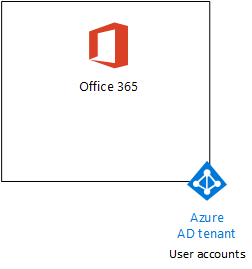 Office 365 E5 Enterprise and EMS E5 trial subscriptions sharing the same Azure AD tenant with your list of user accounts. All your appropriate user accounts (either just the global administrator or all five user accounts) are enabled to use Office 365 E5 and EMS E5. Figure 2 shows your resulting configuration, which adds EMS. In this phase, you create a standalone computer running Windows 10 Enterprise as either a physical computer, a virtual machine, or an Azure virtual machine. Obtain a personal computer and install Windows 10 Enterprise on it. You can download the Windows 10 Enterprise trial here. Create a virtual machine using the hypervisor of your choice and install Windows 10 Enterprise on it. You can download the Windows 10 Enterprise trial here. To create a Windows 10 virtual machine in Microsoft Azure, you must have a Visual Studio-based subscription, which has access to the image for Windows 10 Enterprise. Other types of Azure subscriptions, such as trial and paid subscriptions, do not have access to this image. For the latest information, see Use Windows client in Azure for dev/test scenarios. The following command sets use the latest version of Azure PowerShell. See Get started with Azure PowerShell cmdlets. These command sets build a Windows 10 Enterprise virtual machine named WIN10 and all of its required infrastructure, including a resource group, a storage account, and a virtual network. If you are already familiar with Azure infrastructure services, please adapt these instructions to suit your currently deployed infrastructure. First, start a Microsoft PowerShell prompt. Sign in to your Azure account with the following command. Get your subscription name using the following command. Set your Azure subscription. Replace everything within the quotes, including the < and > characters, with the correct name. Next, create a new resource group. To determine a unique resource group name, use this command to list your existing resource groups. Create your new resource group with these commands. Replace everything within the quotes, including the < and > characters, with the correct names. $locName="<location name, such as West US>"
Next, you create a new virtual network and the WIN10 virtual machine with these commands. When prompted, provide the name and password of the local administrator account for WIN10 and store these in a secure location. $vnet=Get-AzVirtualNetwork -ResourceGroupName $rgName -Name "M365Ent-TestLab"
$cred=Get-Credential -Message "Type the name and password of the local administrator account for WIN10." $vm=Set-AzVMSourceImage -VM $vm -PublisherName MicrosoftWindowsDesktop -Offer Windows-10 -Skus RS3-Pro -Version "latest"
After the physical or virtual machine with Windows 10 Enterprise is created, sign in with a local administrator account. For a virtual machine in Azure, connect to it using these instructions. Next, join the WIN10 computer to the Azure AD tenant of your Office 365 and EMS subscriptions. At the desktop of the WIN10 computer, click Start > Settings > Accounts > Access work or school > Connect. In the Set up a work or school account dialog box, click Join this device to Azure Active Directory. In Work or school account, type the global administrator account name of your Office 365 subscription, and then click Next. In Enter password, type the password for your global administrator account, and then click Sign in. When prompted to make sure this is your organization, click Join, and then click Done. Next, install Office 365 ProPlus on the WIN10 computer. Open the Microsoft Edge browser and sign in to the Office portal with your global administrator account credentials. For help, see Where to sign in to Office 365. On the Microsoft Office Home tab, click Install Office 2016. When prompted with what to do, click Run, and then click Yes for User Account Control. Wait for Office to complete its installation. When you see You're all set!, click Close twice. 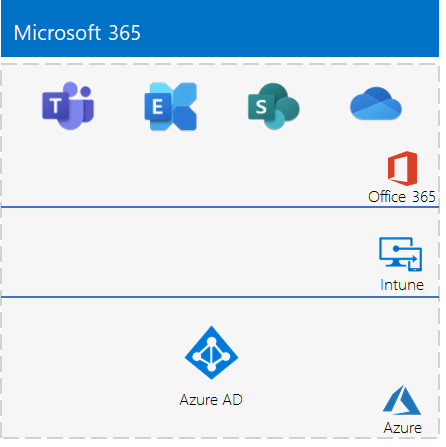 Joined the Azure AD tenant of your Office 365 and EMS subscriptions. 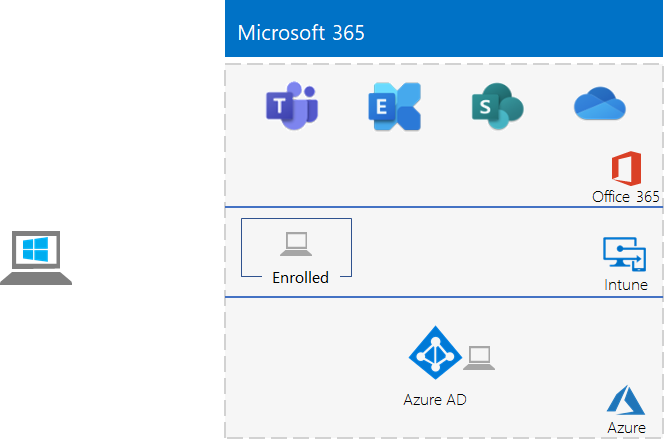 Enrolled as an Azure AD device in Intune (EMS). Has Office 365 ProPlus installed. You are now ready to experiment with additional features of Microsoft 365 Enterprise.